All cruise passengers disembarking at Jamaica’s main ports will soon be treated to a cup of Jamaica’s world famous Blue Mountain Coffee. The Ministry of Tourism is currently in discussions with two local coffee companies to roll out this new gastronomy initiative across the island. Minister of Tourism, Hon. 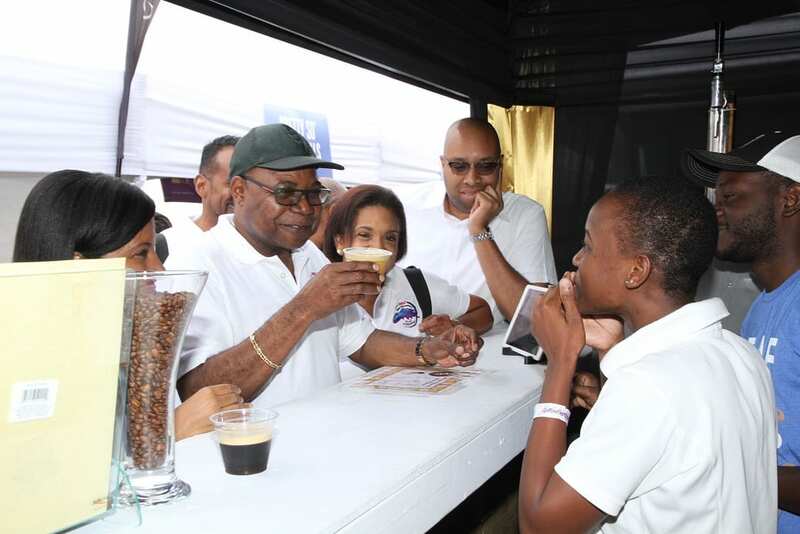 Edmund Bartlett announced the new initiative to the hundreds of coffee aficionados and industry stakeholders who flocked to Newcastle, St. Andrew, for the Festival Marketplace of the second annual Jamaica Blue Mountain Coffee Festival on Saturday, March 2. The Marketplace was the highlight of the three-day coffee festival and featured 45 exhibitors, food demonstrations, live entertainment and a Barista competition. Tourism Minister, Hon. Edmund Bartlett (2nd left) gets ready to sample a coffee cupcake by Alex’s Creations with the help of Nicola Madden-Grieg (left), Chairperson of the Tourism Linkages’ Gastronomy Network. He was touring booths at the second annual Jamaica Blue Mountain Coffee Festival Marketplace, hosted by the Ministry of Tourism at Newcastle, St. Andrew, on Saturday, March 2. Looking on are Executive Director, Tourism Enhancement Fund, Dr. Carey Wallace and Alex’s Creations Marketing Officer Tamara Cox. Jamaica welcomed 900,000 visitors in the first eight weeks of 2019 and projections by the Jamaica Tourist Board indicate that by the end of the first week of March the island will see over one million visitors. Minister Bartlett lauded the creativity and innovation of the exhibitors, which included a variety of products from coffee-infused beauty products to coffee foods and drinks. “Our growth in Jamaica is predicated on creativity and innovation. It will not come from producing new things but from adding value to existing things,” noted the Tourism Minister. “We need to realign our thoughts to see the vast potential of coffee beyond the rich aromatic brewed beverage that we drink. The Tourism Linkages’ Gastronomy Network is opening up channels that will allow for investments and development of a whole line of products that can come from coffee ranging from coffee cake and coffee flour to air fresheners and fertilizers,” said Minister Bartlett as he called for less reliance on foreign markets. The coffee festival, hosted by the Tourism Linkages Network of the Ministry of Tourism, showcased the rich tradition of coffee production in the Blue Mountain region. It began with business development workshops for farmers on March 1, held in collaboration with the Jamaica Agricultural Commodities Regulatory Authority (JACRA) and the Rural Agricultural Development Authority (RADA). The final day of the festival (March 3) was the Jamaica Blue Mountain Culinary Trail, which featured eateries with specialty menus as well as attractions, coffee estates and manufacturing facilities in the Blue Mountain region. Saturday’s Professional Barista Competition was won by Sadiki Gordon of Toyota Coffee House. He was trained by Deaf Can! Coffee, a social enterprise that trains deaf workers in the art of coffee and baking, and has been a professional barista for four years.